I want to take a minute to talk about the proper way to answer a question. See, it is really quit simple. Someone, say your wife, asks you a question, say, a simple Yes or No, question, you should answer either YES or NO. Pretty simple, right? I think so. What is NOT an acceptable answer is "That's fine". What the heck does "That's Fine" mean? Let me give you an example. Wife: Would you like cheese on your hamburger? Wife: So, you want cheese on your hamburger? See the problem? "That's fine" is the problem. A YES or NO question NEEDS a YES OR NO answer! That's fine is NOT Yes or No! Wife: Want me to pick up a newspaper while I am out? This is how I interpret the response. Don't pick up a paper because you never have change and it is a pain to run into the store and get change, then go back outside and get the paper, you are tired, so "THAT'S FINE", don't worry about it. This is how husband interprets the response. Hey, wife is going out to run some errands, she might as well pick up a newspaper while she is out. "THAT'S FINE", grab a paper while you are out running around. See the problem? So...Please people (husbands), learn to answer a question properly! It is not that hard, ya'll (my husband) are smart, you are capable of answering simple questions. These are skills you learned at a young age, put them to practice. Let's give it a little practice, shall we. Wife: Do you like Creamsicles? Wife: Would you like to try some Orange Creamsicle Fudge? Husband: No, I don't like sweets. Wife: What kinda weirdo doesn't like sweets? Husband: The one you married. Wife: Fine, I will eat it all myself. See how smoothly that went....MUCH BETTER! So...I made Orange Creamsicle Fudge....and plan to eat it all myself! This is quick and easy...only has two ingredients and can be customized to any flavor combination you want. I used Orangesicle Supreme Frosting, and white chocolate chips...OMG YUMMY! Line a 8x8 or 9x9 baking dish with waxed paper, this make removal easier, or spray with baking spray. In a microwavable bowl, microwave chocolate chips in 30-second intervals until completely melted and smooth. Stir in frosting, mix until completely combined. Pour into dish and smooth to edges. 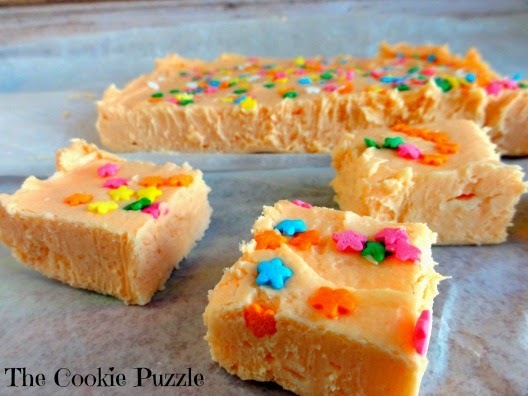 Immediately sprinkle with sprinkles if desired and gently press them into fudge. Cover and refrigerator until firm, about one hour. Remove from refrigerator and cut into squares. Store left over fudge in the refrigerator. 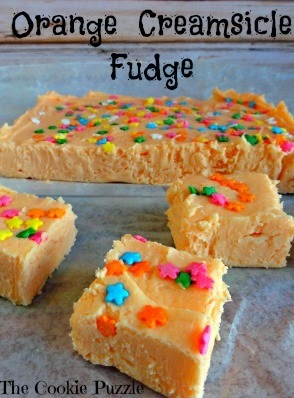 Oh goodness I will have to try this fudge! I'd like to invite you to link up at Simple Supper Tuesday.